Spend a pleasant day in Boston exploring three interesting sites and indulging in a 3-course lunch. 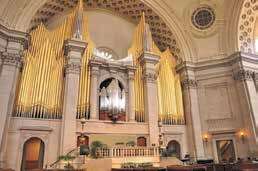 Attend a special Organ Demonstration in the Mother Church located at the spectacular Christian Science Plaza. Visit the Harvard Museum of Natural History to view the Glass Flowers exhibit. These amazing replicas include roots, stems, leaves and even soil made of glass. A father-and-son team of Czech glass artisans, Leopold and Rudolf Blaschka, painstakingly created more than 4,000 life-size models of 847 species of plants and flowers between 1886 and 1936. Harvard Professor George Lincoln Goodale, founder of the Botanical Museum, wanted life-like representatives of the plant kingdom for teaching botany. At the time only crude papier-mâché or wax models were available. There will be a guided tour of this exhibit. For lunch, you’ll enjoy a delicious 3-course meal at Grafton Street Bistro in Cambridge. Entrée choices include: Seared Scallops, Roasted Salmon, Steak Tips or Roasted Vegetable Terrine. All meals include a salad, clam chowder and dessert. Cost: $125 per person for members of CT Hort. Non-members please add $5.